After a nild refresh for 2008, all Nissan Pathfinder models receive standard side and curtain airbags in addition to some packaging changes for 2009. In contrast to the previous year, the V8 is only available in LE trim with 4WD. 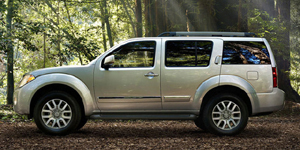 The 2009 Nissan Pathfinder SUV is powered by a base 4.0-liter V6 with 266 hp. Also available is a 5.6-liter V8 with 310 hp.